American politicians Stacey Abrams and Alexandria Ocasio-Cortez have a couple things in common. Until recently, the two women were relatively unknown on the national stage. Neither of them are ‘usual suspects’. And both of them could write history next week. On November 6, their names will be on the ballots in Georgia and New York. Alexandria Ocasio-Cortez is a candidate for the House of Representatives for the state of New York (14th district, Bronx/Queens). No one knew the 29-year-old Latina until last May, when she launched this campaign video. A month later she defeated Joe Crowley during the Democratic primary with 57.5% of the votes. Crowley has been a House Representatives for almost twenty years and was seen as a possible successor of Nancy Pelosi, the leader of the Democrats in the House. In addition, his campaign funds were ten times those of his opponent. Ocasio-Cortez, who actively campaigned for Bernie Sanders in 2016, does not accept any money from powerful and controversial Political Action Committees (PAC’s). Instead, she relies mainly on donations from donors and the efforts of volunteers. – She actively involved the communities in the Bronx and Queens in the campaign and organized her team very effectively. – The campaign had a very clear and successful message. – With that same message, Ocasio-Cortez and her volunteers knocked on doors that were normally passed by. People finally felt heard, and voted for her in great numbers. With her campaign she reaches groups which – according to her – Democrats pay too little attention to: young voters, people who do not vote or are voting for the first time, minorities and the working class. – Since her victory last June, Ocasio-Cortez is hot news: every magazine and news channel wants to talk to the emerging political talent. The idea of ​​Ocasio-Cortez (in time) in the White House is not inconceivable for many enthusiasts. Everything indicates that she will be the winner on November 6th, which would make her the youngest woman ever elected to the House of Representatives. Yes she can! We head south, to Georgia. With her nomination alone, Stacey Abrams wrote history as the first female African-American candidate for governor. Next week she can actually become the very first female African American governor of the United States. That this is nowadays possible in the Deep South, given the history of the Civil War and the Afro-American Civil Rights Movement, makes it all the more exceptional. 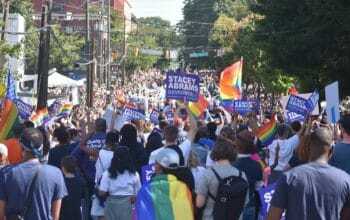 Abrams receives a lot of attention for her campaign strategy. She does not focus on ‘flipping’ Trump voters. Her approach revolves around the conversation with new voters, minorities who think that their votes do not matter, and the mobilization of registered Democrats. Why? It’s simple math. The strategy is based on the statistics that there are enough people in Georgia to win these elections. Abrams believes that people do not vote because they are given no reason to vote. Because they do not see candidates who represent their problems and concerns. She shares her personal story about having debts, about her brother’s struggles with mental illness and drug addiction and the consequences of a poorly functioning health care system. She connects personal stories to urgent themes and policies. In her mind, voters need to feel the urgency to actually make the effort to go to the ballot box. In the presidential election, Donald Trump won Georgia by five percent. For fifteen years, the governorship in this state has been in the hands of a Republican. The election will be more nerve-racking for Abrams than for Ocasio-Cortez. The predictions of Nate Silver are currently 0.9% in favor of her opposing candidate, Brian Kemp. Still here supporters are hopeful that Abrams will write history in the red state of Georgia next week. 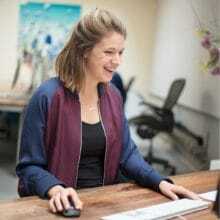 Kathelijne Niessen has a history degree in American Studies and works as a campaign strategist at Campaignbureau BKB. The history and politics of the United States seized her at a young age and intrigues her ever since. It brings her to the U.S. regularly, preferably during election time. In 2016 she campaigned for Hillary Clinton in Colorado for several months.